Are you getting married at The Barn at Berkeley? We have a range of venue decor options available to help make your day perfect. For weddings at The Barn we can install this stunning fairy light canopy in the grand hall. By using warm white fairy lights the canopy is great way of creating some soft romantic lighting for your wedding at The Barn at Berkeley. We always plan to install the fairy light canopy early on the morning of your wedding however if the grand hall is available the day it may also be an option for us to install the canopy then. 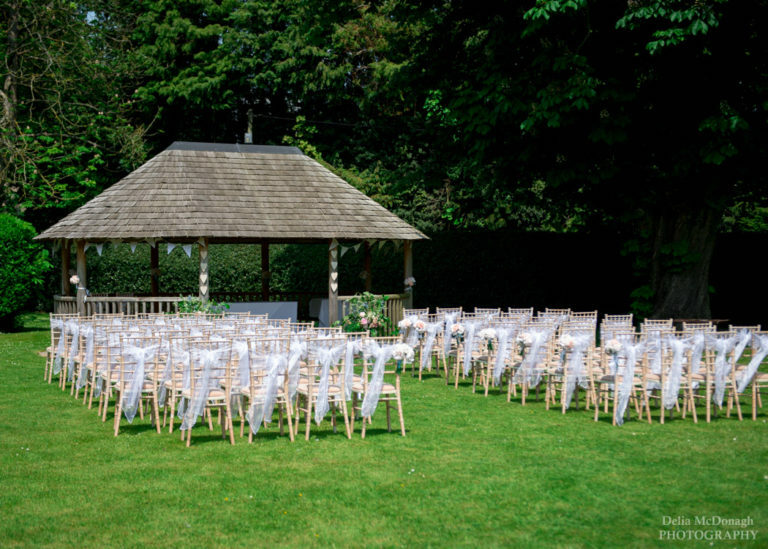 Our elegant limewash chiavari chairs are a great alternative to banquting chairs or chair covers at The Barn and can be used for indoor or outdoor ceremonies along with your wedding breakfast and evening reception. Our range of sashes including over 80 different colours of organza sashes, hessian sashes or ivory lace sashes are a great way to accessorise the chairs if required. We liase with The Barn to organise delivery and collection of your chairs. 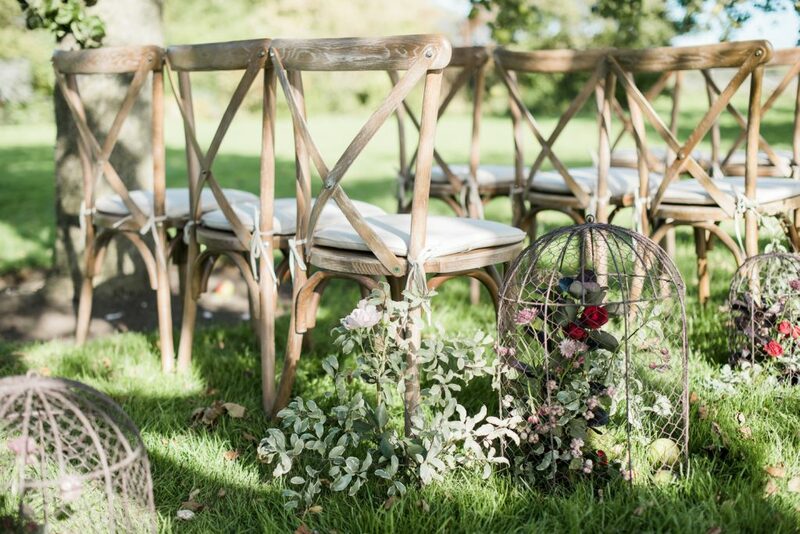 Available in rustic oak or whitewashed our new crossback chairs are another popular seating option for weddings at The Barn and the rustic style of both chairs ties in brilliantly with the barn setting. All our chairs can be used for indoor and outdoor ceremonies and then moved into the grand hall to be used for your wedding breakfast and evening celebrations. With the whole alphabet in stock we can spell any word you like! Popular words include LOVE, MR&MRS and DANCE and having the bride and grooms initials in light up letters is another popular option. We can now also spell your new surname in 4ft light up letters with a smaller MR&MRS sitting on top. Our letters work really well when located around the dance floor area at The Barn, either directly in front of the stage area or offset to etiher side of the dance floor. We stock a range of sashes that we can use to accessorise our chiavari chairs. Sashes we stock include ivory lace, hessian and over 80 colours or organza sashes. If you are interested in hiring sashes along with chiavari chairs please get in touch and we are happy to send out samples of the different colours we offer so you can see the exact colour. Our new rustic wooden trestle tables are proving extremely popular for barn weddings. Each table sits 8 people if using the ends of the table or 6 people if the tables are placed end to end to create long banquet style tables when just the sides of the tables are used. These tables work really well when paired with our matching rustic wooden benches as well as our chiavari chairs and crossback chairs. If you are interested in hiring chairs, tables, letters or fairy lights for your wedding at The Barn get in touch to let us know the items you are interested in hiring – we can be phoned on 07786 328846, emailed at info@bluegoosehire.co.uk or use our contact form HERE. For most bookings we can offer a discount when two or more different products are hired. Once we’ve got your enquiry we will email you an itemsed quote, including any discount, along with details of delivery and collection timings. Once you’ve received our quote we won’t follow it up but are available to answer any questions you have by phone or email. Click here to be taken to more photos of our work at The Barn at Berkeley.